A Show/Driver level vehicle is a 95+ point vehicle. These vehicles are generally found in a climate controlled facility and driven to Concours judging and car shows. The components are original or a proper replacement. Everything that is completed in the Driver level restoration is also done to the Show/Driver, but we take the vehicle to the next level, inspecting and replacing items as needed with more attention to detail. We carefully look the vehicle over noting what is original, what has been altered, what is not working, and what is missing. Depending on the unoriginal or altered parts, we may or may not bring the vehicle back to its complete original condition since some alterations have been made to improve the vehicle. We start to access the overall condition and document it with a complete set of photographs and notes. After doing various tests and inspections on the vehicle, we then start the disassembly of the vehicle, again taking note of all parts and listing what will need replacing, restoring or repairing. The disassembly process is very important to correct and account for the vehicles alterations and changes during its past. 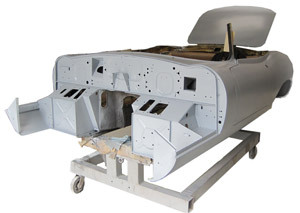 The body is stripped to bare metal and our experienced technicians work it into the original shape. The rust is removed and replaced with new factory original panels. When these are unavailable, we fabricate panels from the correct gauge sheet metal. The doors, bonnet, and boot are properly fit to the body and then removed. Our technicians will continue to spend time fitting the doors, panels, and boot, working the body to ensure a nice smooth finish on the vehicle. The body and parts are epoxy sealed, painted with high quality paint, clear coat when required, color sanded, and buffed to the proper sheen. The frame is restored and refinished and the suspension is painted, detailed and/or powder coated. Most of the structural hardware is replaced and usually upgraded. New rubber, seals and gaskets are applied to the body where needed. The doors, bonnet and boot are refitted. The trim and bright work are freshened up, re-plated, or replaced. The glass is either polished or replaced. The seat frames and various parts are restored, cleaned up and some are powder coated or painted. The majority of the interior, including panels, dash, seats and carpet are replaced with materials, the same or close to factory standards. The cloth or vinyl top for the roadsters may be replaced and carefully fitted for the correct look. The wiring harness is checked over, repaired, or replaced where required. The electrical components, instruments, gauges, knobs, lights, and switches are checked over and brought up to working order. All the mechanical items on the car are carefully gone through. The engine is evaluated, cleaned, and often rebuilt, if necessary, back to factory specifications. 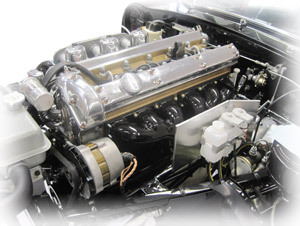 All the components in the engine compartment are evaluated, cleaned, restored or replaced, and painted. 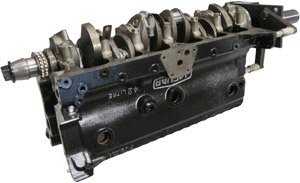 The carburetors, oil pump, water pump, and generator/alternator are rebuilt, serviced, or replaced. The radiator is flushed, re-cored as needed, and detailed or replaced. The battery, belts, hoses, filters, and hardware are replaced where needed. All new fluids are added. The stone guards and drip pans are also restored or replaced. The transmission, clutch system, drive shaft, and rear end gears are all checked to ensure they are in good working order and parts are rebuilt or replaced as required. The under carriage is looked at, including the shocks and suspension parts. Bushings, seals, hardware, and components are replaced. 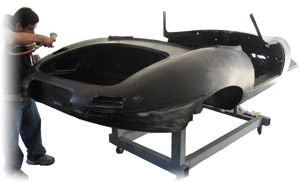 In most vehicles the frame and some suspension parts are painted, powder coated and/or undercoated. The braking system is serviced, replacing many parts from the master cylinder to the rear shoes or pads, to ensure proper working conditions. The brake lines are replaced when worn along with the shoes, drums, pads, and rotors. The gas tank is removed, flushed, hot tanked, and epoxy sealed or replaced. The fuel pump is checked and serviced or replaced and the fuel lines are gone through. If necessary, the exhaust system is replaced. After the vehicle has been reassembled our craftsmen and technicians do a complete check to make sure everything is in good working order. If desired, we will complete a pre-service test drive and adjust the valves, re-torque the head, check the tolerances of the engine, and re-torque the nuts and bolts throughout the vehicle. Right before a vehicle is ready for its new home, we complete the final detail and show its new owner the proper way to drive, care, and maintain their new classic. This service is recommended for all driven and show driver levels. A DVD of the restoration process accompanies the vehicle upon completion.